The services provided by this site give you the chance to find people, places, and businesses in any state. You can browse through the yellow pages to find businesses in your state, or take a look at the white pages to find people. Moreover, Anywho.com offers a reverse lookup service you can use with a phone number. This website will let you browse for people and businesses throughout the United States. You can search for a person in the white pages, or find a business in the yellow pages. In addition, the reverse lookup services offered on Anywho.com lets you find a person or business by entering a phone number. 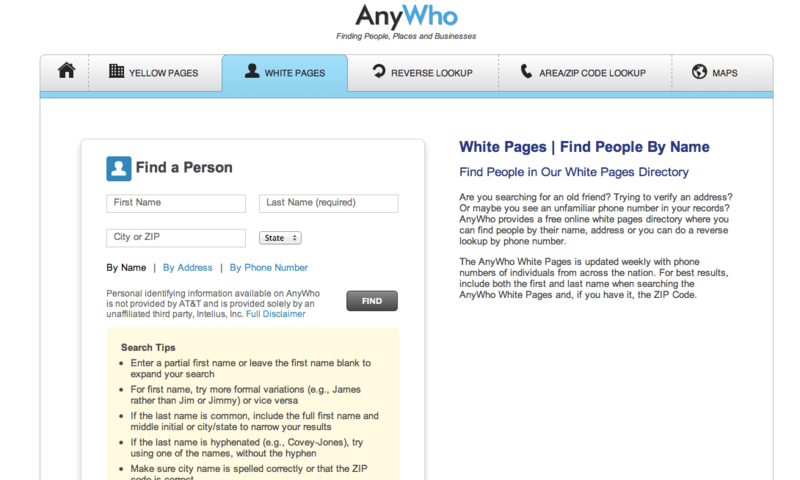 Take a look at Anywho.com and find a phone number, a business, or a person online. The services provided by Any Who give you the chance to browse through the yellow pages and the white pages. You can also use the reverse lookup tool by entering a phone number.